WASHINGTON, D.C. -- President Donald Trump took another swing at Hillary Clinton in the latest sign that his campaign fury hasn't faded, retweeting a mock video that shows him smacking a golf ball that - in the next frame - seemingly strikes her in the back before she stumbles and falls down while boarding a plane. The brief video, posted on Trump's official Twitter account Sunday, appears to be a doctored version of news footage from 2011 that shows the then-secretary of state falling after climbing the airplane stairs. The re-edited video appears to have superimposed images of a golf ball that is shown hitting Clinton. The tweet says: "Donald Trump's amazing golf swing #CrookedHillary." A Clinton spokesman declined comment. The White House issued no immediate comment, and Trump aides have said in the past that his tweets "speak for themselves." The assessment from Rep. Adam Schiff, D-Calif.: "juvenile." Back in July, Trump vented his rage against the media by posting someone else's doctored anti-CNN video that showed Trump pummeling a man in a business suit - the man's face obscured by the CNN logo - outside a wrestling ring. 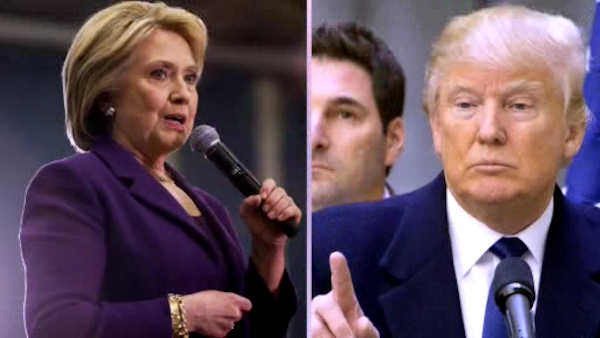 Trump has stepped up his criticism of Clinton since the Democratic presidential nominee re-emerged in the spotlight to promote her new book about the 2016 campaign. She is unsparing in her assessment of Trump, calling him "a clear and present danger to the country and the world." Trump often cites his electoral vote victory as evidence of campaign prowess and popularity with Americans. He is quick to challenge or criticize anyone or anything that might undercut that premise. Trump has established a commission to investigate his unsubstantiated claims that millions of people voted illegally in 2016, when Clinton won the popular vote by nearly 2.9 million votes. "It is distressing though to have a president that, frankly, will tweet and retweet things as juvenile as that," Schiff said on ABC's "This Week" Sunday. "It doesn't help, I think, in terms of his stature. It doesn't help in terms of the stature of our whole country." Clinton's book assigns blame for her presidential loss on several factors, including interference from Russian hackers, accusations leveled at her by former FBI Director James Comey and even her gender. The White House has criticized the book, with spokeswoman Sarah Huckabee Sanders calling it "sad" that the last chapter of Clinton's public life will be defined by selling books with "false and reckless attacks." In a pair of tweets last week, Trump took direct aim at Clinton. "Crooked Hillary Clinton blames everybody (and every thing) but herself for her election loss. She lost the debates and lost her direction!" Trump wrote. Referring to Clinton's past description of some Trump supporters, he later tweeted: "The 'deplorables' came back to haunt Hillary. They expressed their feelings loud and clear. She spent big money but, in the end, had no game!"